Individual InAs/GaAs quantum dots are studied by micro-photoluminescence. By varying the strength of an applied external magnetic field and/or the temperature, it is demonstrated that the charge state of a single quantum dot can be tuned. This tuning effect is shown to be related to the in-plane electron and hole transport, prior to capture into the quantum dot, since the photo-excited carriers are primarily generated in the barrier. Self-assembled semiconductor quantum dots (QDs) have attracted considerable attention within the nanostructure research field in recent years due to their possible optical and optoelectronic applications [1–3]. The discrete energy levels in QDs also open up novel possibilities for studies of the physics in a zero-dimensional system. The most common technique to fabricate QDs is by Stranski–Krastanow (SK) self-assembly, which is based on heteroepitaxy. The mismatch in lattice constant between the substrate material and the epitaxial material results in a highly strained layer. After growing a critical thickness, a two-dimensional continuous wetting layer (WL) can be transformed into the zero-dimensional QDs. For multiple purposes of QD structures, from integration into a sophisticated optoelectronic device to studies of fundamental properties of QDs, it is of utmost importance to understand the interaction between the QD and the WL and the surrounding matrix in which they are embedded. The reason for this is that the electrons and/or holes are normally not both generated in and extracted from the intrinsic QD states. On the contrary, the carriers are either supplied from the matrix by an external current to recombine in the QD, as in a laser or light emitting diode application, or alternatively the carriers are excited by light absorption in the QD, to give rise to an external current in the matrix/WL, as in a photo-detector or photovoltaic application. In all these cases, the carriers will be transported to or from the intrinsic QD region, via the surrounding material. For example, in structures fabricated by the SK growth mode, the QDs will coexist with the remains of the WL and it has been demonstrated by several groups that the interaction between the QD and WL states will have a significant impact on the QD characteristics [4–12]. For example, the modulation rate of a QD laser is limited by the thermal emission of carriers from the QD into the WL in differential transmission spectroscopy measurements [4, 5], and the threshold current in QD lasers was shown to significantly depend on the carrier capture mechanisms . The non-zero absorption at photo-excitation far below the WL was attributed to crossed transitions, involving one bound QD state and one delocalized WL state . The localized states of the rough WL acting as intermediate states was proposed as an explanation to the observed PL up-conversion, seen in single InAs/GaAs QDs . In our previous works, the carrier capture mechanisms into the QD via the WL were studied in the presence of a lateral electric field , an external magnetic field  and with an additional infrared (IR) laser excitation  as well as by means of temperature dependent PL . In the current study, the transport of photo-excited carriers in the WL has been explored by micro-photoluminescence (μPL) spectroscopy of an individual QD. 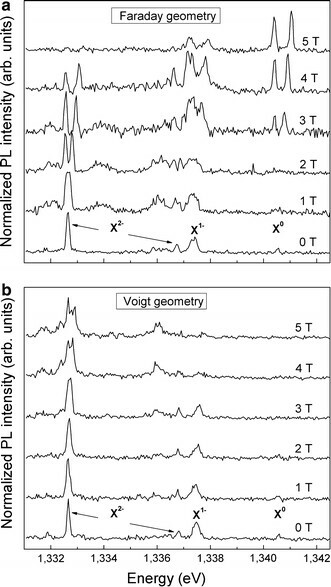 The combined dependence of the μPL characteristics on temperature and on the magnitude and direction of an external magnetic field has been investigated. Special attention has also been focused on the μPL of the WL itself. Our observations show that the QD charge configuration can be effectively tuned if one can control the carrier transport in the WL, in the vicinity of the QD. This carrier transport is discussed and explained within a simple model of the QD structure energy diagram. The sample studied consists of InAs QDs grown on GaAs with Molecular Beam Epitaxy (MBE). The QDs were formed from a 1.7 monolayers thick InAs layer deposited at 530°C. A first growth interruption of 30 s was used to improve the size distribution, whereupon the QDs were covered with a thin GaAs cap layer with a thickness of 3 nm before a second growth interruption of 30 s. Finally, a 100-nm-thick GaAs layer was deposited to protect the QDs. The QDs developed in this process are lens-shaped with a height and diameter of 4.5 and 35 nm, respectively. No rotation of the substrate was used during growth, resulting in a gradient of the density of QDs across the sample. In our present investigation, a piece of the sample with a low QD density has been used for the μPL experiments where the average distance between QDs is more than 10 μm. This allows direct optical access to an individual QD without arranging apertures or mesas, which would restrict the area of the sample excited by the laser. The sample was mounted on the cold finger of a continuous-flow cryostat, which allows control of the temperature in the range from 3.8 K up to room temperature. A magnetic field could be applied either perpendicular (Faraday geometry) or parallel (Voigt geometry) to the sample surface, while the laser beam was kept at perpendicular incidence to the sample surface. A laser beam from a tunable Ti:Sp laser pumped by a solid state laser was focused to a spot diameter of 2 μm onto the sample surface with a microscope objective, hence only one QD is present within the laser spot. The resulting luminescence is collected through the same objective and mirrored into a monochromator equipped with a liquid nitrogen–cooled CCD, allowing a spectral resolution of around 0.1 meV. As a first step to investigate the carrier transport prior to QD capture, a series of μPL spectra of a single QD were measured as a function of sample temperature (T). Figure 1a shows the dependence of the total integrated PL intensity from the QD on temperature in the range 4–90 K. The excitation energy hν exc = 1.540 eV used corresponds to excitation in the GaAs barrier. The energy positions of the QD and WL luminescence monitored in Fig. 1 are ~1.333 and 1.45 eV, respectively. Two temperature regimes are identified in Fig. 1a; (I) as the temperature is raised from 4 K up to 35 K, the QD PL intensity increases by more than a factor 2. (II) as the temperature is further increased from 45 to 85 K, the QD PL intensity is gradually reduced, to render non-detectable at 90 K. In the following, an interpretation of the observed temperature dependence is given, based on the schematic energy diagram of the QD sample shown in Fig. 1b. Upon excitation in the barrier, as used here, the photo-excited carriers that eventually contribute to the QD PL will inherently undergo a lateral transport, i.e. in the sample plane, before capture into the QD. During such a transport, the carriers are considerably affected by the potential irregularities at the interface between the barrier and the WL, which are known to exist in samples with self-assembled QDs [13–15]. These irregularities will serve as localizing potentials for the carriers, which might, with a certain probability, become trapped and recombine at these localizing potentials. Such WL-related recombinations appear with a strong PL at low temperatures, normally accompanying the QD PL in experiments on low or moderate QD density samples (see e.g. WL spectra in [8, 16]). Moreover, the WL PL exhibits a rich fine structure resulting from the inhomogeneous distribution of the size, shape and alloy of the WL localizing potentials [17, 18]. The capture rate into and the escape rate out of the WL localizing potentials are denoted and respectively, for the electrons (holes) in Fig. 1b. The capture rates are essentially limited by the emission rate of a cascade of acoustic phonons  with a built-in temperature dependence based on: (i) the temperature dependence of the acoustical phonon velocity and, (ii) the WL band edge shift with temperature . The temperature dependence of the acoustical phonon velocity is, however, small  and can be considered negligible. The thermal shift of the WL band edge is also small in the temperature range studied here and compensation for this shift by tuning the excitation energy shows that this effect can be neglected (not shown). Hence, the increase in the QD PL intensity in regime I (Fig. 1a) is attributed to an increase in the thermal escape rate out of the WL localizing potentials, facilitating an enhanced capture of carriers into the QD. This attribution is further supported by the temperature dependence of the WL PL intensity, also shown in Fig. 1a. The increase in the QD PL intensity is accompanied by a decrease in the WL PL intensity, indicating that the carriers are redistributed from the WL to the QD. The temperature dependence of the WL PL indicates an activation energy around 2 meV for the carriers in the WL, in agreement with our previous studies . The decrease in the QD PL intensity, when the temperature is in regime II, is primarily ascribed to a decreased carrier population in the WL (acting as a carrier reservoir for the QD) due to non-radiative recombinations. 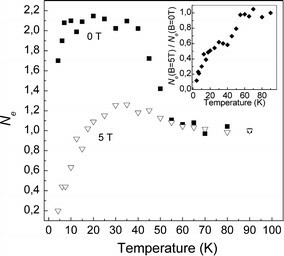 Additionally, the possibility for thermally assisted escape of the carriers out of the discrete QD states increases at these temperatures and has been shown to take place at temperatures well below the correspondence to the thermal energy, k B ·T, equal to the energy separation between the initial and final states [4, 5]. As an external magnetic field, B = 5 T, is applied perpendicular to the sample, i.e. in Faraday geometry, the rate at which the WL PL intensity decreases with T is reduced in the range between 10 and 40 K (Fig. 1a). This observation is attributed to a magnetic field–induced quantization of the carrier motion, which enhances their possibility to remain longer in the WL than is the case at B = 0. To verify this explanation, the probability for carrier localization at a 5 T-field was evaluated. For this evaluation of the carrier localization due to an applied magnetic field, the conventional localization criterion, based on a comparison of the product with unity , is employed. Here, is the cyclotron frequency, is the scattering time for electrons (holes), e is the elementary charge, and is the effective mass for electrons (holes), taken as = 0.067 m 0 and = 0.5 m 0, respectively . We find that = 8.9 and = 0.29 at B = 5 T , which indicates that the electron transport is severely inhibited by the B-field (meaning that the electrons start forming cyclotron orbits in between scattering events), while the hole motion is essentially unaffected at B = 5 T. Thus, the difference between the WL PL behavior at B = 0 and 5 T (Fig. 1a) is explained in terms of a decreasing electron migration with increasing B-field, leading to an enhanced luminescence in the WL. At T > 90 K, no luminescence is monitored from either the WL or the QD, which is commonly attributed to an enhanced non-radiative recombination rate with increasing temperature . The fact that the electron migration is affected by the external B-field in Faraday geometry can also be traced in the μPL spectra of the QD as discussed in the following. The magneto-μPL spectra of an individual QD (Fig. 2a) were measured with the same excitation energy as above, i.e. hν exc = 1.540 eV and with the external B-field applied in Faraday geometry. Altogether four emission lines, denoted X 0, X 1− and X 2−, have been monitored and identified as recombinations of neutral, single and double negatively charged exciton complexes, respectively . The X 2− emission exhibits two spectral lines (Fig. 2), split in energy by the electron–electron exchange interaction [23, 24], since the two electrons remaining in the QD after recombination of the exciton can have either parallel or opposite spins. The most striking observation in Fig. 2a is the intensity redistribution between the spectral lines with increasing B-field. At B = 0, the μPL spectrum is dominated by the X 2− emission, but its intensity decreases with increasing B-field at the expense of the appearing X 1− and X 0 lines. The redistribution of the exciton lines (Fig. 2a) indicates a B-field-induced “neutralization” of the QD charge state. In contrast, when the magnetic field is applied in Voigt geometry (Fig. 2b), no corresponding redistribution effect is observed and the QD is dominated by the X 2− emission at any B-field strength in the range employed, 0–5 T. This observation gives additional support for the quantized in-plane electron transport in the presence of a B-field in Faraday geometry, while a B-field in Voigt geometry, i.e. parallel to the transport, is unable to induce such a quantization. Additional studies have shown that for photo-excitation energy below the WL band gap energy, i.e. when no carrier transport takes place prior to capture into the QD, the redistribution effect vanishes . At this point, it is interesting to consider the process that generally governs the in-plane carrier transport in a QD sample. It has been established, by us as well as by others, that there is a built-in electric field (F) attributed to ionized impurities, with a component directed in the QD plane (see [9, 10] and references therein). The magnitude of the electric field will differ between different QDs, but can, to some extent, be controlled either by an additional IR laser excitation or by applying a lateral bias , resulting in significant effects on the carrier transport in both cases. For the specific QD studied here, an internal field of F = 500 V/cm has been estimated . Hence, in the present study with an applied B-field, the carriers are migrating in a crossed electric and magnetic field and will consequently exhibit a motion with the drift velocity V dr = F/B directed perpendicular to both fields . An increased B-field will consequently lead to a decrease in V dr, as experimentally observed. Figure 3 shows the combined effect of elevated temperature and external B-field in Faraday geometry on the QD μPL spectra. At T = 10 K, the difference in the QD charge state between B = 0 and 5 T is striking and similar to the case shown in Fig. 2a and discussed above. For increasing temperatures, the QD charge state difference between B = 0 and 5 T decreases and for T > 65 K, the two spectra are almost identical except for the Zeeman splitting of all emission peaks at B = 5 T. Within our model on the carrier transport, the observations made in Fig. 3 are interpreted as follows. At T = 10 K, the thermal escape rate out of the WL localizing potentials is negligible, which is evidenced by the high WL PL intensity in Fig. 1a. Hence, when applying a B-field at this temperature, the drift velocity of the electrons will decrease. The probability for the electrons to be captured into the WL localizing potentials correspondingly increases (while the holes are unaffected as discussed above). The electrons with a higher probability will remain and recombine in the rough WL, resulting in a lower electron occupancy of the QD. 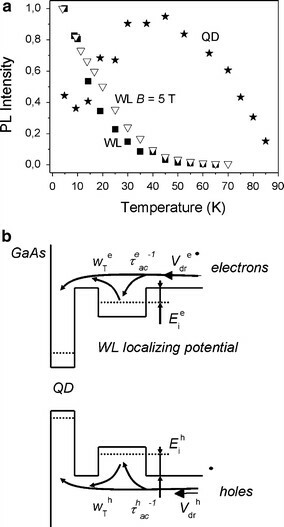 When the temperature is increased, the ability for the B-field to localize the electrons at the WL potentials decreases due to an increased probability for thermal escape of the electrons out of these potentials. At T = 65 K, a negligible number of carriers will remain localized in the WL, as evidenced by the vanishing WL PL intensity in Fig. 1b and accordingly, no difference is observed in the QD charge state between B = 0 and 5 T (Fig. 3). Finally, the experimental results of the QD μPL dependence on temperature and applied magnetic field are summarized in Fig. 4. Here the charge state of the QD is expressed in the parameter N e, corresponding to the number of extra electrons accumulated in the QD which is evaluated from the μPL data according to Eq. 1. 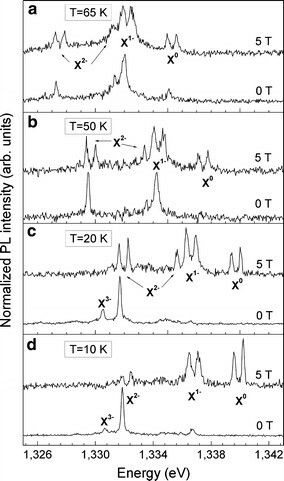 I PL is the integrated intensity of the X 0, X 1− and X 2−-peaks, respectively. The temperature dependence of N e at B = 0 and 5 T was measured and is given in Fig. 4. At B = 0, N e initially increases with temperature from N e ≈ 1.7 at T = 4 K to N e ≈ 2.1 at T = 10 K. On the other hand, at B = 5 T, N e ≈ 0.2 is monitored at 4 K and increases to N e ≈ 1.3 at T = 30 K. The initial increase in N e with increasing temperature in these cases is attributed to thermally activated escape of electrons out of the WL localizing potentials and suggests that the corresponding ionization energy for electrons is smaller than for holes, which is reasonable considering that the holes are ~7 times heavier than the electrons . At T > 40 K, N e is seen to decrease and to stabilize at N e ≈ 1, i.e. with two electrons occupying the QD ground state, independent of the B-field. The inset in Fig. 4 shows the calculated ratio between N e at B = 0 and 5 T, respectively, in the studied temperature range. This ratio goes toward 1 with increasing temperature, as the effect of the B-field vanishes. These results combined with the results presented in Fig. 1a indicate that the QD population dynamics at T > 60 K is primarily not determined by the transport in the barrier/WL interface, but is instead attributed to thermally assisted escape of carriers out of the discrete QD states. Specifically, for N e = 1 at T > 60 K, the escape of holes is proposed to be the reason for the observed extra electron in the QD and a decreasing QD PL intensity. A model for the transport of photo-excited carriers in the WL plane of a QD structure was proposed and tested by exerting the structure to elevated temperatures and external magnetic fields of varying strength and direction. Localizing potentials for the carriers in the WL were shown to play a crucial role for the behavior of the QD PL. It was demonstrated that a magnetic field enhances the capture into these localizing potentials, whereas an increased temperature enhances the thermally assisted escape out of these potentials. By applying an external magnetic field in Faraday geometry, in contrast to Voigt geometry, the electron migration toward the QD is decreased. Elevated temperatures will increase the electron migration toward the QD. Hence, a temperature and magnetic field–induced charging control of an individual QD was achieved. The authors would like to thank P. M. Petroff and W. V. Schoenfeld for providing the sample. This work was supported by grants from the Swedish Research Council (VR) and the Swedish Foundation for Strategic Research (SSF) funded Nanopto consortium.